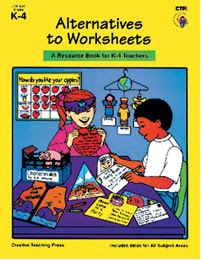 Creative Teaching Press has a terrific resource to change worksheets into fun projects compiled into a book called Alternatives to Worksheets written by Karen Bauer and Rosa Drew. They recommend using the projects for grades K-4, but teachers can modify projects to upper elementary grades. I've used them with students in grades K-6 as motivational and meaningful projects which can be adapted to any topic or inquiry study you are doing. These projects focus on written work and students enjoy creating them so much, they are motivated to write! Some of my favorite ones to use in motivating children to write are Accordion Books, Shape Books, Pop-up Cards, Paper Vests, Book marks, Door Hangers, Cubes and Visors. 1. Students can work with a small group, a partner or independently. 2. Teachers model the project and students personalize their own creatively. 3. Brainstorm what you know about the project/topic together to help students get started.